Ever since Spielberg’s 1993 masterpiece Jurassic Park captivated audiences and set box-office records, it became clear that dinosaurs were going to get people in the theaters to see more of them. After two sequels, the franchise took a break for 14 years before it was resurrected again in 2015 with the blockbuster smash Jurassic World. Despite its flaws, I was still hit in the face with a large dose of nostalgia that made me appreciate it and essentially relive my childhood. The original Jurassic Park was one of those VHS tapes that were played nearly every day in our household, after all. Come three years later, we have Jurassic World: Fallen Kingdom – the follow up to Jurassic World and the fifth entry into the Jurassic Park franchise. 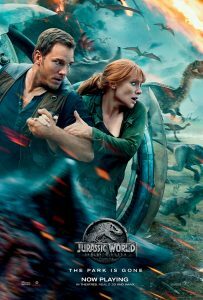 Chris Pratt and Bryce Dallas Howard reprise their roles from the previous film as a former raptor trainer and former head of the park, respectively. 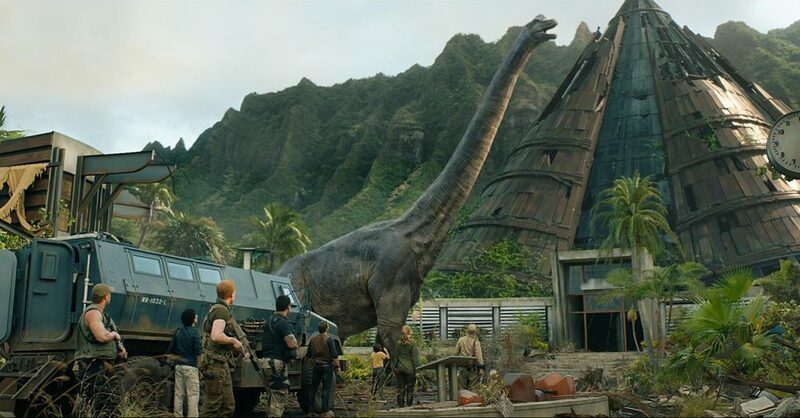 Claire (Howard) is now an activist for dinosaur rights, as Isla Nublar is at risk for a volcanic eruption and she’s fighting to save their lives while it appears the government wants nothing to do with it. It’s not until she’s hired by John Hammond’s former business partner, Benjamin Lockwood (James Cromwell), that she has an opportunity to do so. 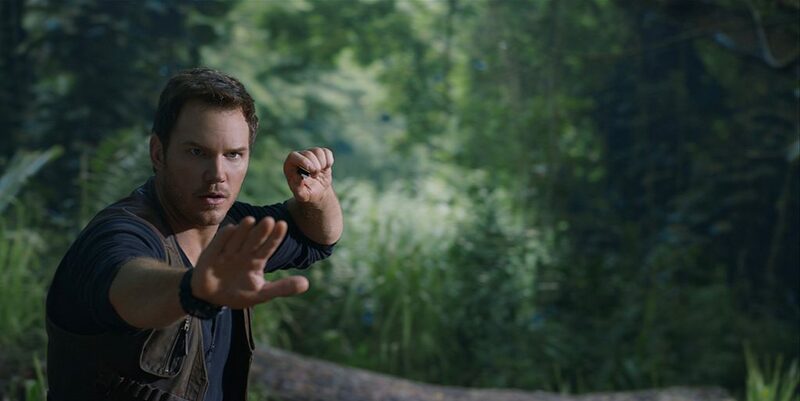 But there’s one caveat – they need someone familiar with raptors to help catch Blue, the one remaining raptor on the island and who else but Owen Grady (Pratt). Now we have our main characters together and at least some motive to get them to go back to the island in which they faced certain death previously. Coming along with them are newcomers to the franchise, fellow activists Zia (Danielle Pineda) and Franklin (Justice Smith). Zia wasn’t too bad as a medical aid throughout the film, though she wasn’t really given a whole lot to do. Franklin, who acted more as a comic relief than anything, was barely tolerable. This boy was terrified of just getting on the plane to go to the island – did he forget it’s inhabited by dinosaurs? Not to mention, surely he’s heard about what happened there three years prior. He does have a moment later that’s useful, but I think they could have easily found other ways around that. Colin Trevorrow stepped down from the director’s chair this time around and only co-wrote Fallen Kingdom with Derek Connolly. The director this time is J.A. Bayona (The Orphanage, A Monster Calls) and despite a not-so-great script to work with, I think he did an extraordinary job making this film look beautiful. There are quite a few breathtaking shots throughout the film that can leave the viewer in awe, let alone a few scenes in which he masterfully sets up the scene with the trickery of lighting and shadows. Fallen Kingdom lost its way pretty quickly for me. The first half hour is Pratt-less and when he does show up, he’s not oozing the charisma I’m used to seeing with him. In fact, his character doesn’t evolve at all by the end of this movie, even. He’s just kind of there. The plot points were pretty predictable as well as the twists, which you could see coming from quite a ways away. The most interesting thing to me was revealed near the end of the second act, but then it was never talked about again! Something so revolutionary in this Jurassic Park world, and it’s basically just revealed through dialogue nonchalantly, effectively leaving the viewer hanging (and not in a good way). Look, if you’re going to see Jurassic World: Fallen Kingdom for mindless entertainment, you shouldn’t be disappointed. As mentioned above, Bayona gives us plenty of beautiful shots to admire throughout the film and even effectively makes the latter half of the film an isolated haunted house setting. The action is fun when it’s present and you’ll surely find yourself laughing at times. I just can’t get over how generic and half-witted the story and its characters felt.